These are just a few of the many letters we receive each week , as you will see our service speaks for itself. I’m sorry for the delayed response but I was in Cornwall over the weekend following the Voyage. On Friday evening my wife and I were in Padstow to see the ‘Predator’ arrive. They were at the tidal gate in plenty of time and were piped into the inner harbour when it opened at 5.30pm. It was a great scene and everything we could have hoped for. On behalf of the small team here I thank you and your colleagues for your generous support. Presenting us with ‘Predator’ at the 11th hour was a huge relief at the time, yet they behaved as if it had been planned for months – a credit to you at the Port of Milford Haven. Karl told us all he had a smooth run over to Cornwall and was on form when he needed to play. Then the following morning the ‘Predator’ did the second harbour entry very well, and then departed well in time before the gate closed. Please pass on our thanks once again. We try to keep our web site up to date with the rolling story. In Padstow we were fortunate to meet up with the TS Jack Petchey which is a Sea Cadet training ship; so they will take us to Falmouth and Fowey, then on to their home base in Plymouth. From there we have one more week into Portsmouth.............it has been a challenge! a very enjoyable weekend diving with you. It's only taken 2 years to finally see your underwater sites but it was worth the wait. We all had a great weekend and were well looked after by the crew. Hopefully will get to dive with you again soon and I will certainly recommend your boat if anyone is looking to dive Pembroke. Many thanks for making the Powerboat course such a brilliant time!! Not only did we learn a huge amount, that even after many years experience, we were still unaware of but also our boat handling skills have improved immeasurably. Your thoughtful and progressive approach to learning made the experience fun and taking us right up to tacking 2.5 m swells by the end an achievement in itselk. Thanks once again !! Patrick, Sam and Joe Collier. On behalf of Bay Divers may I thank you both for a fantastic days diving on Saturday. Right from the start when you gave us our options for various dive sites, then proceeded to take us there. Down to the pre dive briefing which were very informative and most helpful. Two great dive sites in the North Wall and the Lucy was topped off with a Seal who showed us how diving should really be done. The constant supply of Tea and Coffee were much appreciated. We would as a club recommend you to all we come in contact with. A huge thank you to both you and Alan for taking such good care of us over the weekend. All involved thought you guys were great, really easy going and relaxed, which makes the entire weekend so much easier. I sent a separate email with a link to the Pembroke pictures and videos, including the seal video. It’s too big to send in an email so please let me know if there is a problem with the link I sent and I will send it on a disk or put it on another site. Thanks again buddy. I will be in touch soon about arranging another trip. Nice to meet you too Sue. Thanks for all your help with the organisation. Many thanks for a great 2 days diving last weekend. Everyone seemed to thoroughly enjoy themselves. Shame about the weather on Saturday but at least we got out to Skomer on Sunday which was good. With a user-friendly boat ladder, an excellent tea service - and a very knowledgeable skipper, what could be better? Many thanks, and hope to see you again next year! many thanks for a great weekend - we liked the fact that you gave us a number of options to dive each day – much better than many skippers. The team are still raving about the trip and I may well be in touch to charter your boat next year. Please pass on our thanks to Alan. I will be putting a report on our website soon and also DIRX. Dear Len, I am just writing to thank you for your excellent instruction last week whilst teaching me power boating levels 1 and 2. It was a truly excellent course and a lot of fun too, something which lacks in the middle of London. Sadly I am back in the thick of things again, but you have certainly given me the confidence to get out on a boat, safely, and inspired me to maintain an interest in the sport – so many thanks indeed. I think I will need to book a day with you in slightly choppier water too. Be assured that I have my piece of rope and continue to practice bowlines! Having dived recently with another local charter, in which he promised to take us to the Smalls only to be let down at the last moment. Then to wait 20 minutes in the water after surfacing to be picked up by the boat, then to be told the lift was not working. 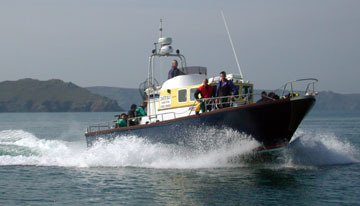 Our faith in diving around Pembrokeshire was restored when we booked to go with Dive Pembrokeshire UK and dive from Predator. We had a fantastic day, relaxed and easy and what was promised we got. I just wanted to drop you a brief words of thanks for looking after our small group from St Ives so well on Predator last week-end. I must say you turned out to be an excellent skipper for us. Both friendly and helpful and with considerable knowledge of the waters in which we dived in respect of both navigation and marine life. It is always reassuring to be dropped spot on the wreck or reef and have accurate information about what to expect interms of currents and conditions. You gave a thorough safety briefing and were obviously well aware of the needs and limitations of the divers on board Predator, which proved a pretty good boat to be on. I must say we also enjoyed your party tricks too when it came to feeding the gulls! Had an excellent time, a wonderful welcome. We recommend you highly to anyone. Enjoyed it very much, will be coming again in Sept.
Will be coming back, can we please book Predator for next year. A most enjoyable weekend and we have booked again for 2010. A well run organisation, welcoming, homely and professional. Our parties comments have all been very positive, we would be very happy to dive with you again in the future. As regular users of Charter Boats around the world, we would rate this as some of the best service we have ever encountered. The day or rough seas only proved how good a skipper Len is and the versatility of diving in the area. 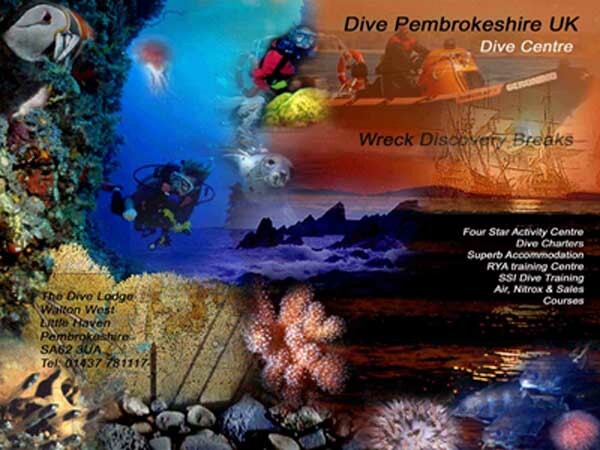 The four star rating is well deserved and we hope we can arrange to dive with you again in the future. Just a short note to thank you for your hospitality on our visit in April. We have already begun to recommend you to our fellow divers. Just a quick mail to say thank you very much for your efforts to make our holiday a great success and helping us out when problems arose. I personally have never dived with such a professional, good natured and helpful boat crew. I know Kev said that this was your job, but I felt that the levels of assistance and sound advise offered, went well beyond that usually given by a dive charter and I for one was very glad to have it. We had such a great weekend we really did not want to come home! Thanks you for making us feel so welcome. I don't think we have been so relaxed in a long time. Just a note to thanks you for an excellent weekends diving. We all enjoyed the dive sites you suggested for our group and were spot on for all our requirements. Phil, Mike, Ian and the boy. Thanks from us all for a super weekend-the way we all felt so welcome, the help you gave me in getting it organised, and super diving in great conditions. It goes without saying that everyone wants to come again next year. Just a little note to thank you for your patient tuition and sound guidance on the Open Water Course last week. I had a fantastic time, the challenge and experience is something I will remember always. Your positive good humour is a marvelous gift and I am grateful for your efforts on my behalf. I would like to take the opportunity to thank you for an excellent two days RYA course and for the friendship shown to me by yourself and first class instructor Kevin. Just a quick note to thank you all for a great weekend. We cannot believe how much information Kevin managed to squeeze into our brains. We would recommend your RYA courses to anyone. Thanks again for an excellent course set in a family atmosphere. We really felt at home. Thank you all very much for the excellent Powerboat course last weekend. It was superbly run and extremely processional and of course great fun. My objective was to feel sufficiently confident that I could take a group of divers out to dive offshore, and bring then all back safely having thoroughly enjoyed their day. This objective has been achieved in spades-Thanks! Thanks for everything you've done to make us feel welcome. Hospitality excellent very good atmosphere, a real home from home. We felt part of your family and will partake of this again in the near future. Keith, Pauls, Tony & Diane. Just a note to say thank you for looking after us so well on our dive trip. You made us very welcome and diving was very well organized. Please thank every one of your team on our behalf. Just a short note to express our sincere thanks for a great weekend. As usual the accommodation, company and breakfasts were legendary! A very big thank you Len for introducing two tropical fishes to the balmy waters of Pembrokeshire! Your attention to detail and infectious enthusiasm was much appreciated by us both. The accommodation was excellent. The amazing lounge! A games room! Beer! A comfy bed and a big breakfast! - what more could a diver want? Dear Len, This is a quick mail to say THANKS for a terrific weekend from the Members of Marlin Sub-Aqua Club. Clive and Alun could not do enough for us, and particularly myself. I was somewhat worried as to how I would manage after nine years out of sea diving, I have kept diving fit but, until my operation, my mobility was severely curtailed. I have been diving for over 43 years and will not give in! This was my big challenge and I did it, with the help of my friends, I had no problems apart from muscles which had not been used for years! Saturday my face was described as radiant, what a lovely compliment. So we have booked two more weekends with you next year, and I hope to become a regular, we all have nothing but praise for your team, no disrespect, but I do hope I am able to renew our acquaintance next year and to experience a trip on the Predator also. Please pass on our gratitude to Clive and Alan and hope they may remember us next year. Fantastic organisation who needs the Red Sea? It is all here on our doorstep. See you next year, sorry I can't make the Boat show. Incidentally I repair wet and drysuits as well as custom made if you ever need our services. Terrapin wetsuits. www.wetsuits.uk.com I hope to get our diving side up next year. Just a short note to thank you for some super diving last week. Please thank the Skipper Len for "dropping us on the nose" of every dive site we visited. Just a quick note to thank you profusely for the wonderful job you did in "gettiing me certified" I can honestly say it has been one of the most challenging and exciting experiences I've had. Thank you so much for your fantastic hospitality (well over and above the call of duty) you made me feel so very much at home. The skill and dediccation of your instructor team is a credit to you and themselves. Yours with tremendous gratitud and many fond memories.